With the clocks going forward an hour tomorrow, winter is starting to near an end. In between the bouts of rain, we have been getting quite a bit of sun. Unfortunately, mostly all my bok choy in the hydroponic garden ended up bolting. I pulled the bolting ones and planted some new seeds in the rockwool. Upstairs, I removed the rest of my lettuce, as all those plants had started growing a flower stalk. Pictured to the left is me trying to hold 3 whole lettuce plants. 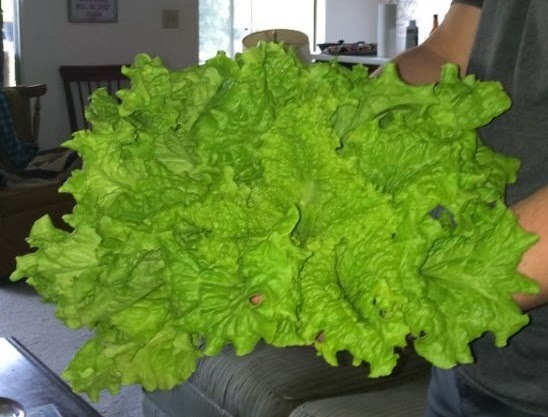 They were really big, much larger than any lettuce I'd grown before. Now I'll be eating salads for days as I wait my new transplants. I'll get more photos next week, stay tuned.